Sidney Crosby saw Jakub Voracek's glove on the ice and wasn't going to let his opponent pick it up easily. 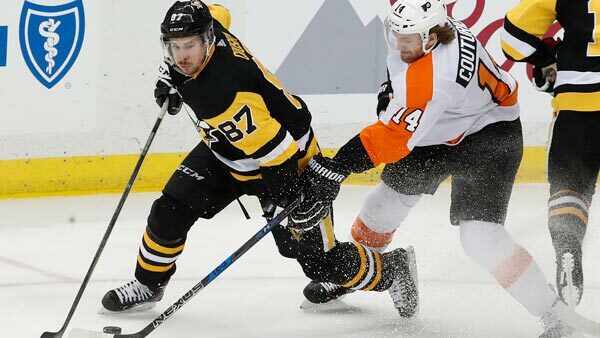 Crosby pushed the glove away with his stick and reignited a melee in a good, old-fashioned Pittsburgh-Philadelphia playoff game that featured three fights, way more scrums and 158 penalty minutes. When Crosby was asked afterward why he did it, the Penguins captain responded: "I don't like them. I don't like any guy on their team." "It was awesome," then-Penguins general manager Ray Shero said. "If you look at it, it was wild. It really was. You had villains on both sides and people that hated each other." NHL executive Colin Campbell once famously said the league sells hate, and at no time is hate more widely bought, sold, distributed and celebrated than during the Stanley Cup playoffs. The NHL's divisional playoff format was brought back specifically to ignite old rivalries and create new ones, which has been a successful venture even if hate looks different than it did in the days of the "Broad Street Bullies." Playoff rivalries are no longer about dropping the gloves or laying out bone-crushing hits. "Playing against teams with high stakes when there's a lot on the line - win or go home - that's how you have rivalries," veteran New Jersey Devils center Brian Boyle said. "When it's us or it's them, that's how you find those rivalries. The same guys for two weeks, I think that's how you build them." "The best thing about most of them are is the proximity to where they live, the close ones, but I think it needs a good playoff (series) against that individual team to create the rivalry full hand," Wild coach Bruce Boudreau said. "Until you play seven games in 14 nights where you learn to hate the opposition." Playoff series in back-to-back years made the Penguins and Washington dislike each other plenty, and they'd meet again in the second round if they advance this year. Nashville and Anaheim developed a nontraditional rivalry with intense series the past two playoffs, making that a potentially combustible Western Conference final. When Predators players think about those Ducks series and other tense ones over the past several years, they know there haven't been a lot of fights - and they're not alone. The past four playoffs have included a total of 39 fights. There were 46 fights in the 1978 postseason alone and an incredible 85 in the 1988 playoffs. "You get the odd scrum that turns into a fight and stuff like that, but there's not too much fighting left," Nashville defenseman Ryan Ellis said. "You probably see the amount of blocked shots go up in the playoffs, the amount of hits - the little things that may not be on the stat sheet is kind of what I guess gets your team through the playoffs. It's just little things like that that really is the playoff intensity." Boyle, who has blocked 113 shots in 106 career playoff games, has seen more fights in blowout games deep into a series than at other times because there's too much at stake to take a retaliatory penalty. "A lot of times you see a lot of other guys turn the other cheek in a playoff series," Boyle said. "You don't want something like that to make a difference in a series." Making a difference is more about scoring a big goal than leveling a big hit or punching someone in the face. Look at the Penguins' and Flyers' rosters now and the likes of Crosby, Evgeni Malkin, Phil Kessel, Voracek and Claude Giroux are far more likely to beat someone with a slick shot than their fists. "I think the game has changed in how it's being played out there," Pittsburgh coach Mike Sullivan said. "I think personnel has changed. But I think rivalries are rivalries. There's always a heightened emotion associated with the games." So much so that retired player and former Penguins coach Ed Olczyk said of Penguins-Flyers, "It only takes one player, one comment from somebody, where all bets are off and that gasoline tank will be ignited fairly quickly." Crosby recalls more fights between the teams in the past - he was involved in two six years ago in the game he swatted Voracek's glove away - but doesn't want to downplay the intensity of this rivalry. "You never know what can happen," Crosby said. "I feel like both teams are always kind of at their best, and there's always a little bit extra in those games." Capitals defenseman John Carlson said he thinks playoff rivalries have gotten worse more because of what players can get away with, the physical toll games take and the memories of the nasty things that happen. "Those things last forever, really," Carlson said. "I can remember every single playoff series we've played in and this guy made a dirty hit in this game, this guy slashed me for no reason - two-handed me in the back of the legs - in this game, just stuff like that." Peter Laviolette, who coached the Flyers in that 2012 series and has been with the Predators in emotional series against Anaheim and Chicago, knows that's just how the league wanted it. Where is the fun if everyone likes each other? "I don't think there's ever been a love lost between Toronto and Boston or Montreal and Boston or Philadelphia and Pittsburgh," Laviolette said. "They wanted those rivalries. They wanted to make sure that those were the matchups in the playoffs. It's been great hockey."